Latest quarterly JLL report sees trend continuing in fourth quarter. Residential prices in all segments in both Hanoi and Ho Chi Minh City continued to increase in the third quarter and are expected to increase again in the fourth quarter, according to JLL’s Q3 report on Vietnam’s property market released on September 28. Ho Chi Minh City welcomed a high-level of supply in the quarter. New supply totaled 8,438 units in the apartment segment, with the affordable and mid-end segments accounting for 44 per cent and 37 per cent, respectively. In the villa/townhouse segment, new launches reached 820 units, with those priced at $225,000 to $450,000 per unit accounting for more than 70 per cent. Residential demand in the city also increased in the quarter. In apartments, take-up was 8,133 units, up 5 per cent quarter-on-quarter. The quarterly ratio of units sold to those newly-launched averaged around 65 per cent. In the villa/townhouse segment, sales reached 814 units, an overall improvement. In the primary market, apartment prices were higher quarter-on-quarter across all markets, with the affordable segment registering the highest growth, of 2.2 per cent. In villa/townhouse, prices continued the prevailing uptrend at 2.4 per cent quarter-on-quarter, mainly driven by District 9 and Nha Be district. 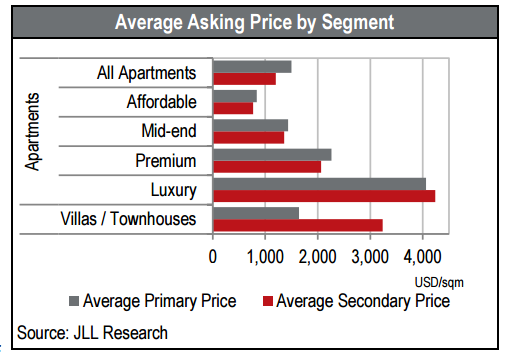 In the secondary market apartment price rises slowed compared to recent quarters. Completed properties were increasingly under pressure from abundant supply. In villa/townhouse, prices grew for the 11th consecutive quarter, actively supported by increased investment sentiment. Ho Chi Minh City’s residential market is expected to witness abundant supply with prices rising further. “Investment sentiment is likely to remain strong in the coming quarters and considerably so in the villa/townhouse sector,” the report stated. In Hanoi the fluctuation in the residential market was different than in Ho Chi Minh City. While in Ho Chi Minh City the affordable segment saw the highest growth, of 2.2 per cent quarter-on-quarter, in Hanoi the premium segment was highest, with 3.6 per cent quarter-on-quarter. Supply remains abundant in Hanoi’s residential market. New supply in the third quarter totaled 7,854 units, down 6 per cent quarter-on-quarter but up 5 per cent year-on-year. Of the total, nearly half were priced at more than $1,200 per sq m. On a district basis, Thanh Xuan and Nam Tu Liem districts led the quarter’s launch with around 2,000 units each. In the primary market, prices continued the prevailing uptrend, with the vast majority of total primary supply registering increases in the range of 1-5 per cent. In the secondary market the uptrend continued but at a slower rate than in recent quarters, at 1.1 per cent quarter-on-quarter versus the quarterly average of 1.5 per cent since the first quarter of 2015. Some completed projects, especially in the high-end segment, offered lower prices quarter-on-quarter, responding to recent increases in competition. Supply will rise in the next quarter in Hanoi. More than 11,000 new completions are expected, nearly 70 per cent of which will be in the mid-end segment. New supply is expected to reach about 10,000 units in the quarter, with subsequent launches from existing projects responsible for 50-60 per cent. 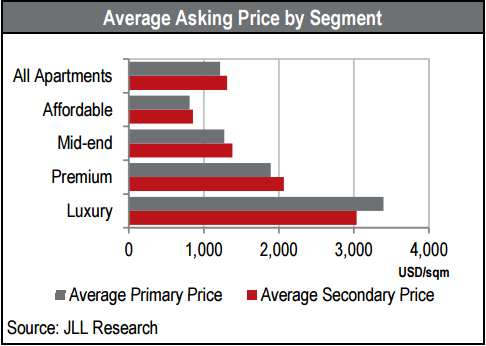 Prices are likely to continue rising on the back of new launches and improved conditions.